Here’s some good news for mobile app makers looking to enter the Chinese market. 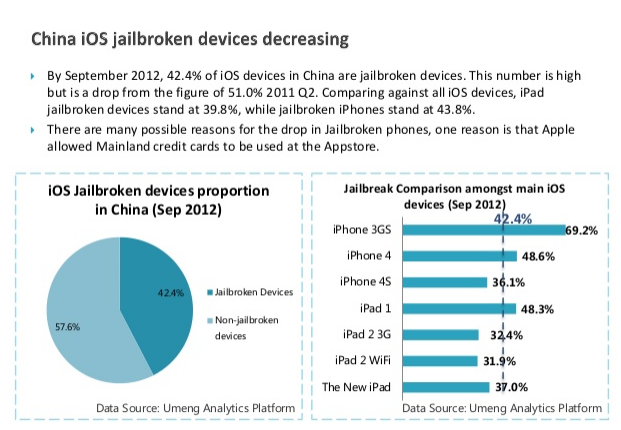 Not only are there a whopping 200 million Android and iOS devices in circulation in China, jailbreaking is down from last year. 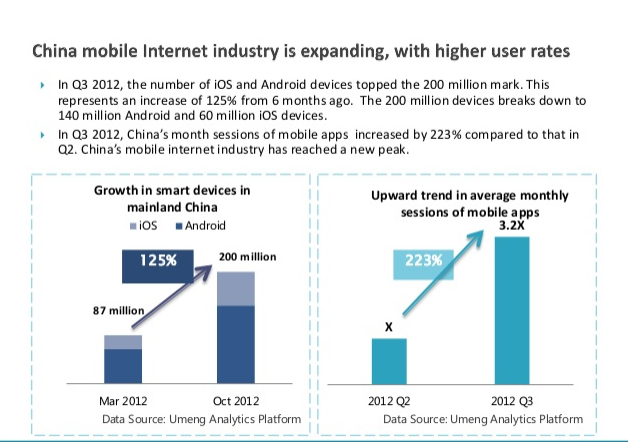 Umeng, the biggest Chinese mobile app analytics company, says it is detecting that only 42.4 percent of mainland iOS devices are jailbroken, down from 51 percent in the second quarter of 2011. Yes, that figure still sounds like an unbelievable share, but this is China. Umeng says jailbreaking is down because Apple started allowing consumers to use local bank cards over the last year in the app store. Why are a decreasing number of jailbroken phones important? Because it means there are fewer chances for consumers to pirate apps or in-app purchases, which eats into profit margins of developers. The schemes are often quite elaborate and involve Taobao, the eBay of China. In other good news for developers, app sessions are up 223 percent from the second quarter of 2012. The number of Android and iOS smartphones in active use in China has also nearly doubled in a mere six months to 200 million from 87 million in March. 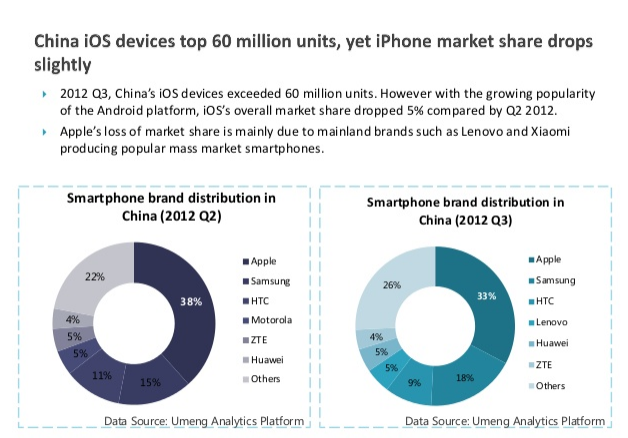 Even though mainland China now contributes about 15 percent of Apple’s sales, Umeng says Apple’s marketshare is actually declining slightly thanks to competition from Chinese handset makers like Lenovo and the much buzzed-about Xiaomi. Umeng says Apple’s marketshare dropped 5 percent quarter-over-quarter. Umeng, which is an alum of former Google China head Kai-Fu Lee’s incubator Innovation Works, has its analytics in 65,000 apps across iOS, Android and Windows. The company has raised more than $10 million from Innovation Works and Matrix Partners.